I never liked writing book reviews. If a book is stupid, what can you possibly say that would help someone other than, the book is stupid. Don't read it. Or if the book is good, great book. Go and buy it. 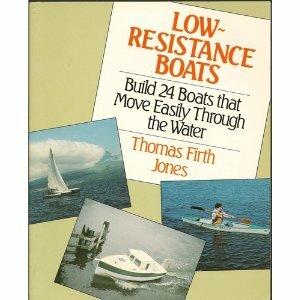 So here I am, recommending Low Resistance Boats by Thomas Firth Jones. This books had been sitting dormant on my book shelves for something like two decades. The only reason I rediscover books like these is that when I run out of interesting things to read, I go to my book shelves and try to find something that I haven't read in a while or never in hopes of being entertained in the short time between when I lay down in bed and fall asleep. Low Resistance is one of those books on a topic that on the face of it seems rather technical and therefore should be dry. But it isn't. The author is one of those rare combos, someone who seems to know what they're talking about and at the same time can write about it in an engaging fashion. If you've read any of Pete Culler's books, you will know what I mean. You may not care about the relative merits of a lug rig vs. a sprit rig, but when Culler writes about them, you read anyway because he entertains. Anyway, if you run into a copy of Low Resistance Boats, buy it and read it. That is, buy it if you are at all interested in the various aspects of small boat design, everything from canoes up to a small motor launch with sailing dinghies in between. Jones has designed and built all of these and writes about the various issues he had to deal with in an engaging and revealing way. He is engaging because he is honest and writes about his mistakes as well as successes. This is not a how-to book. You will have to look elsewhere to find out how to actually build a small boat, and it is not a design book either. There are no charts and tables plotting length to beam ratios vs. resistance and such. Still, you get lots of useful info on why some boats are better than others.